The Prisoner (1967-1968). Art Director/Jack Shampan (Modesty Blaise, The Ladykillers), Set Dresser and future Art Director Ken Bridgeman (Billy Liar, Straw Dogs), Set Dresser/John Lageu (Captain Scarlet, Thunderbirds). 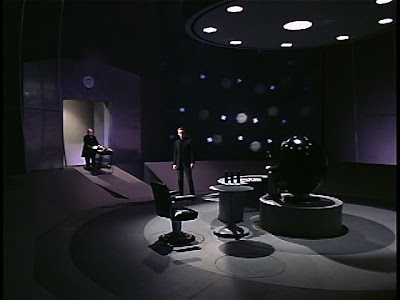 You know you have slipped into the quasi-Sci-Fi world of The Prisoner when Patrick McGoohan first walks inside from the resort town into the ominous, eerie lair of Number Two. This Ken Adam-worthy room sports a central globe chair in black surrounded by an assortment of sleek furniture that rises electronically from the floor. A massive screen lights the room with fluctuating patterns and sounds (like a giant lava lamp), and doubles as a Big Brother eye into secret files and into citizen's private lives. Brushed metal doors seal the room. 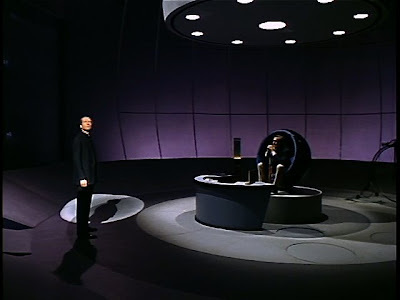 The music cues help to define the chilling tone when McGoohan’s Number Six first enters this chamber in the episode, The Arrival, and remains one of the most unforgettable moments in Spy Vibe culture. 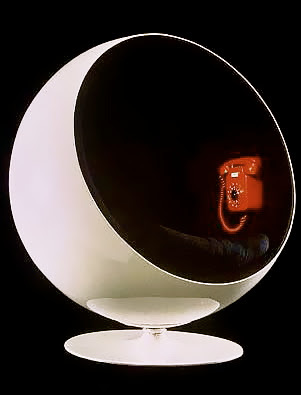 Number Two's famous chair is based on the Ball Chair (see below), designed in 1963 by Finnish furniture designer Eero Aarnio and seen as a height of industrial design at the time. 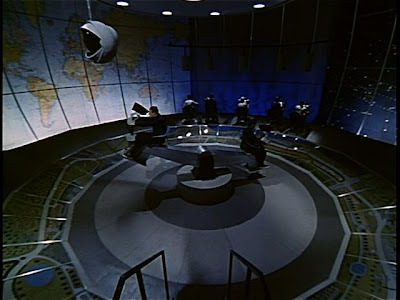 The Control center in The Prisoner is another iconic set, sporting a giant screen, large electronic probes that look like eyeballs, and a rotating seesaw where observers peer into view screens that resemble mounted machine guns. From this room, the jailers of the Village keep a close watch on their citizens, and when needed, subdue or kill them with a large, floating white ball called Rover. These imaginative sets establish a Kafkaesque, 1984-like environment for the modern (and Mod) age. STAY TUNED FOR SET #5 -AND- THE TOP 5 SETS FROM SPY AND MOVIE WRITERS AROUND THE GLOBE! Check out Spy Vibe's production set series, an event that gathered together many writers to celebrate the best spy sets from cold war-era film & TV. Guest Set Lists: Lee Pfeiffer, Jeremy Duns, Armstrong Sabian, Steve Bissette, Roger Langley, Matthew Bradford, Wesley Britton, David Foster, Matt Kindt. Spy Vibe's Set For Adventure here, Set Countdown #10, #9, #8 ,#7, #6, #5, #4, #3, #2, #1. Of course The Prisoner ca,e in at No. 6!